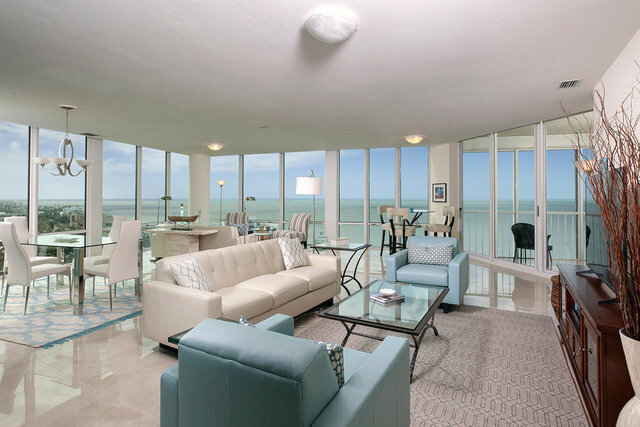 Imagine walking into this extraordinary panoramic view of the gulf views with floor to ceiling glass windows. You will feel like you are on a luxury cruise ship looking out at an endless water view of the Gulf of Mexico. Marble flooring throughout the home enhancing the tropical furnishing and decorations make this home true luxury living. The bright and light kitchen with custom handles, island with breakfast bar, built-in desk, and white appliances. The eat-in kitchen area is nestled in the custom curved wall design and provides a beautiful view of the bay and gulf. The master suite has unobstructed ocean views and access to the balcony. The en-suite boasts dual sinks, a large soaking tub, enclosed private water closet, bidet, and Corian countertops. The guest suite is looking over the bay with panoramic glass views, a sitting area, and a private bath. The den/bedroom has a custom built-in desk and access to the balcony. This penthouse lives like a private luxury home with the amenities of Le Ciel Park Tower. Private pool and spa overlooking the beach, fitness center, outdoor kitchen, and Tennis.